7 players are involved in the drill, 4 yellows and 3 green. 1 Yellow and 1 Green player start at A, B & C- while the last Yellow player starts at D. Yellow score in goal 1 and Green in goal 2. Each scenario has a maximum of 30sec to play out before a whistle goes and the next ball is played. The drill starts with players at A and B involved in a 2v2 when the whistle goes the Yellow player at A starts with ball 1. 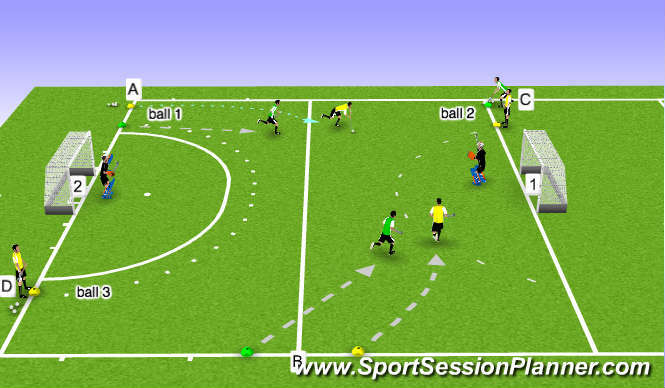 Once the 2v2 has been played out the Green player at C starts with ball 2, creating a 3v3. Once the 3v3 has been played out the Yellow player at D starts with ball 3, creating a 4v3.